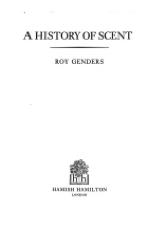 A History of Scent, by Roy Genders. The perfume historian’s go-to book, looking in-depth at how perfume evolved from Ancient Egypt through Roman times, the mystical fragrances of the east, the scents of early England via the Elizabethans and Stuarts. Published in 1972, if you get your hands on a copy it may well smell authentically musty, but nevertheless it’s packed with extraordinary, fragrant factoids.